Rome wasn't built in a day. It took many years. And it has also taken many years to get our house looking the way it does today. 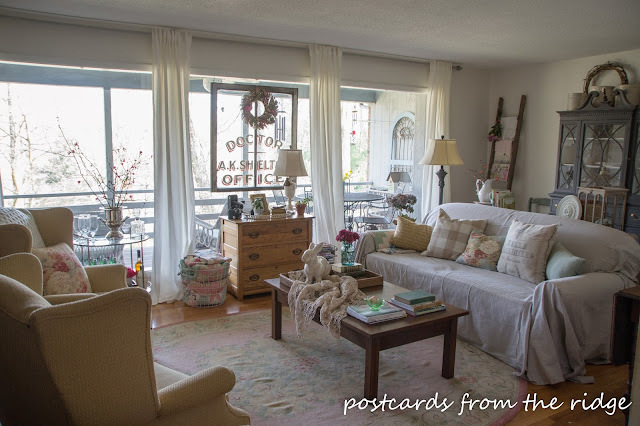 There are still plenty of projects to do here, but today I'm looking at some of the progress we've made and reminding myself that updating a 50-year-old house takes time. If you follow me on Facebook or Instagram, you've probably seen some of the plans we have for our half bath remodel. Above is how the bathroom looked before we bought the house. Since then the blue wallpaper has been removed and the blind changed to a wooden one, but that's about it until now. I can't wait for the updated version of this room! Note - the bathroom renovation is now complete and can be seen in its entirety here. Today I'm also sharing some before and after pictures of a few of our other projects. 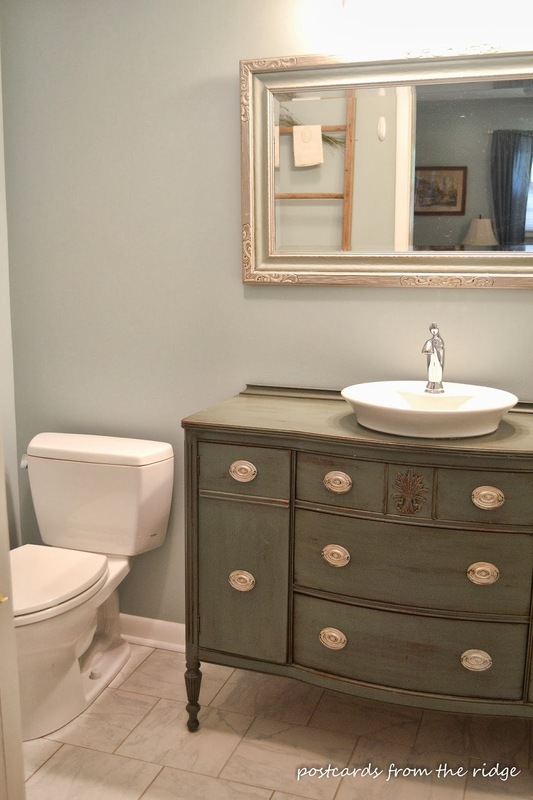 The before shots were taken before we bought the house, so the decor reflects the previous owner's style. 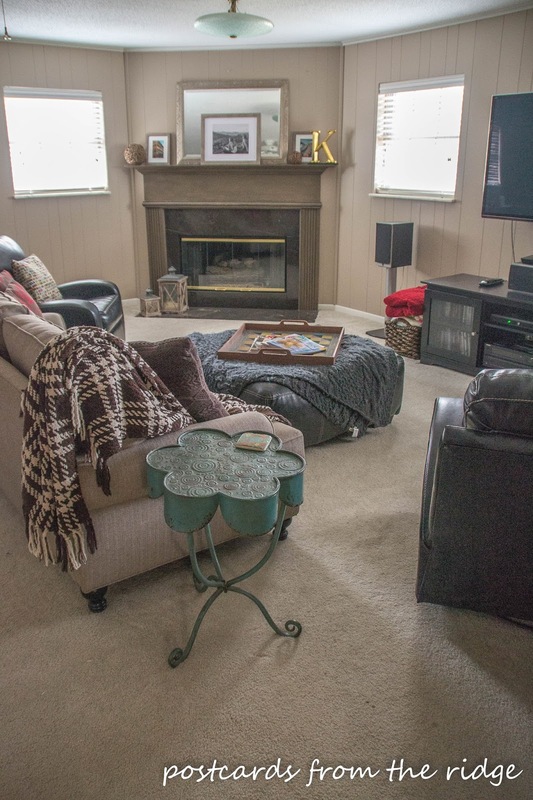 I'm not only sharing this to remind myself of how much the house has changed, but to encourage you to not overlook an old house that isn't decorated to your taste. If it's built well, has a good layout, and is in a good location, go for it. You can make it more your style over time and save lots of money by doing some or all of the work yourself. Look beyond anything cosmetic and remember you don't have to have a huge budget to make a big impact. We don't all live on an HGTV budget. But I really do love the Fixer Upper show and how they take an overlooked house and make it a showstopper. Here it is after a remodel in November 2013. We didn't change the layout but had all of the finishes and fixtures replaced. We had it taken down to the studs and gave it a complete makeover. To see more of this remodel, go here. Let me just say that this is still a very small master bath. They didn't build big bathrooms in the 1960's. And that's okay with us since we don't spend much time in there. 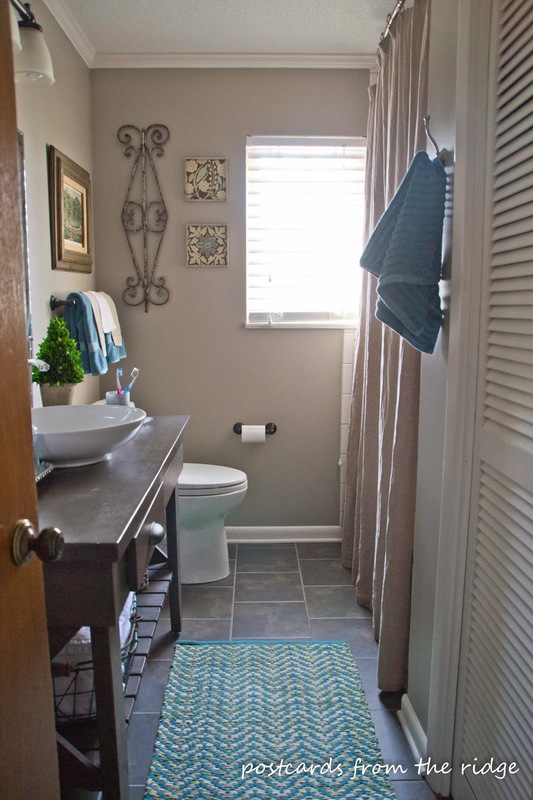 We gave it a total makeover and had it enlarged slightly in the spring of 2012 after we discovered that there had been a slow leak from the shower. Go here to see more of this room. We changed in here was the paint, window treatments, and the floors which we had refinished. This room is very challenging space that frustrates me. It's a long narrow room that doesn't have much actual wall space. This is the most recent furniture arrangement and is the first one that I really do like in here. Go here to see more of this space. The biggest changes in here were the floors which were refinished after the carpet was removed, paint, and window treatments. Well, and our furniture is different too. We put our bed in front of the large window facing the door opening instead of the wall to the right. Some of the bed linens get changed out seasonally, but the white quilt usually doesn't change. 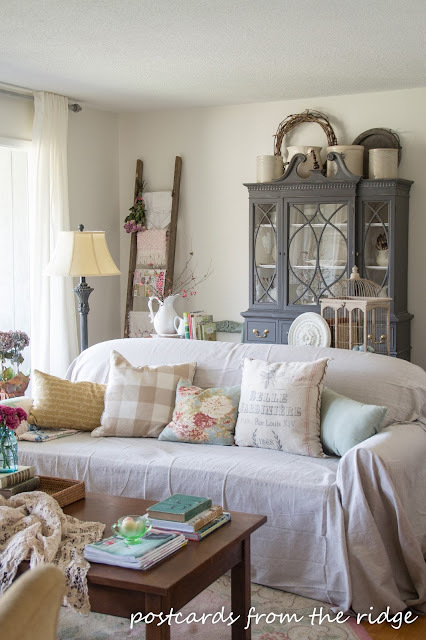 Changing pillows, shams, and throws are an easy way update the room for each season. 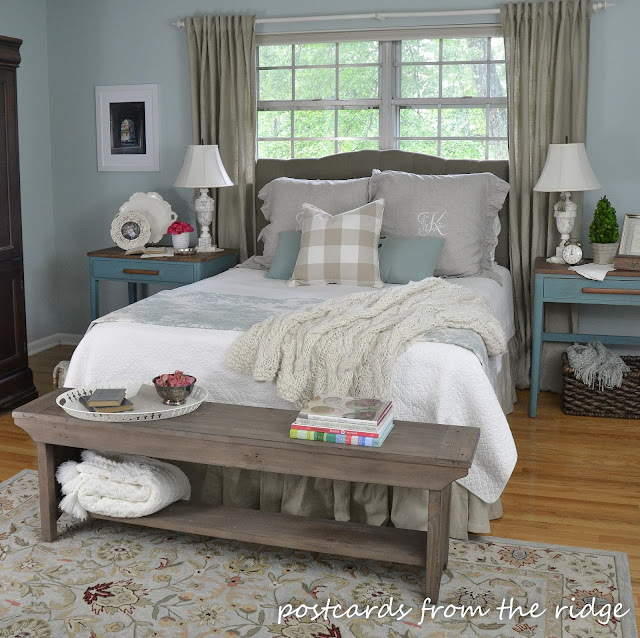 Go here to see more of the master bedroom details. 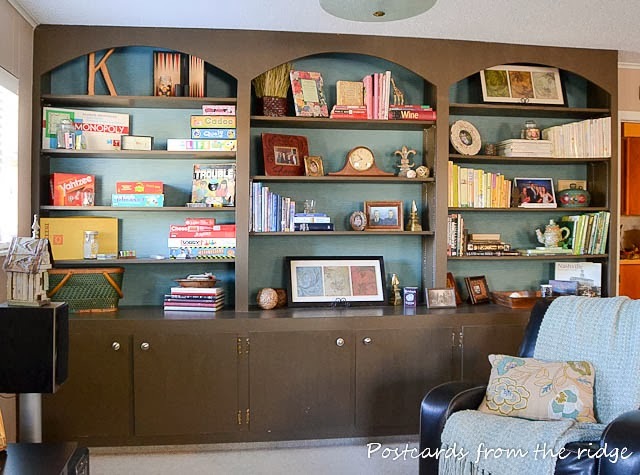 The bookcases got a makeover with paint, new hardware, and paintable wallpaper on the back wall. The walls, trim, and mantel also got a paint makeover. To learn how to paint paneling and give it a brand new look, go here. This little hidden room in the basement is my most recent project and has made the most dramatic change since we moved in. It's tucked away in the corner of our basement and was a storage/dumping room for the previous owners and had become one for us too. I decided it was wasted space that I needed to claim for myself, and this is the result after lots of paint and elbow grease. I love this room now. To see more of it, go here. To see how I made the stencilled faux rug go here. 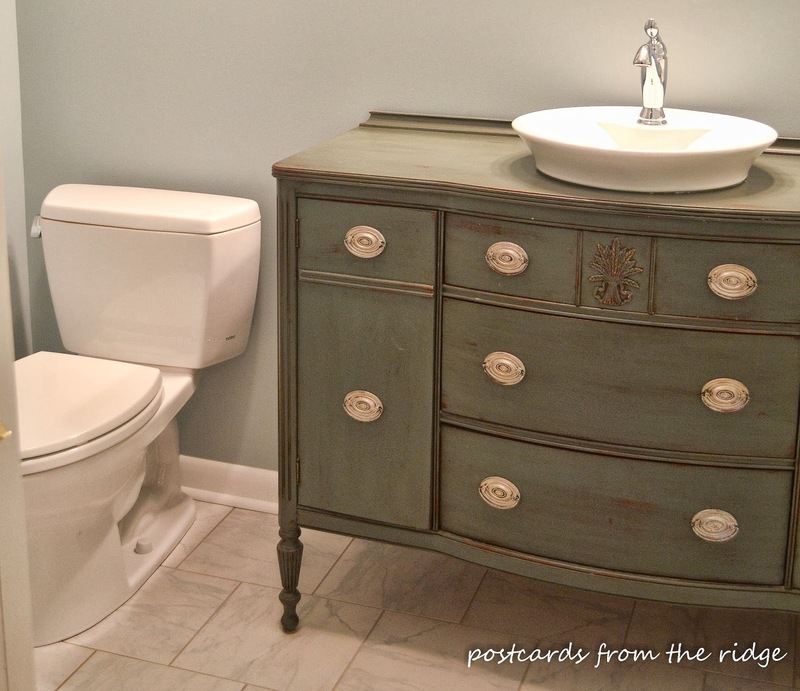 For tips on painting a counter like this one, go here. 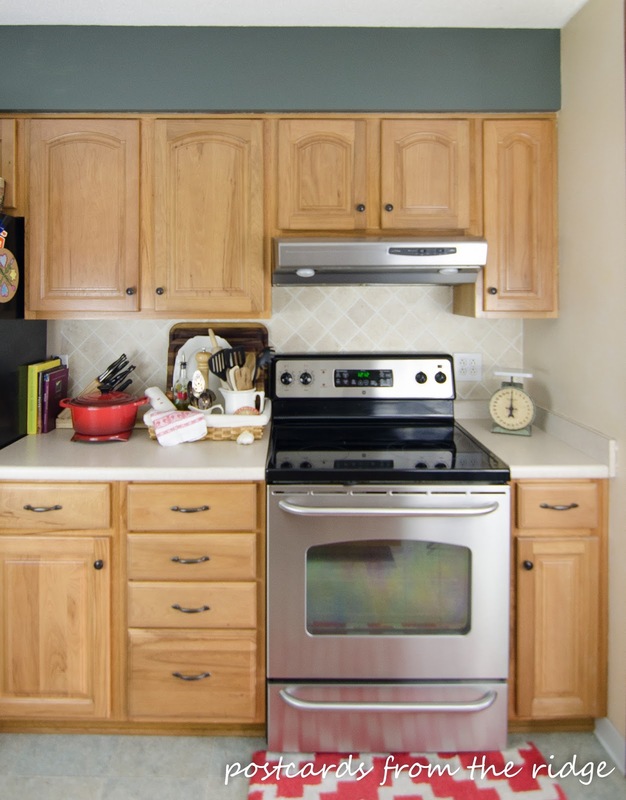 The kitchen has gotten new paint and cabinet hardware, and we've replaced and upgraded the appliances over the years. I painted the faux tiles on the backsplash not long after we moved in. I swore I wouldn't paint these cabinets since they're newer and in really good shape, but lately I've been thinking about how much it would update and change the look of the entire space. I haven't decided for sure to do it, but I'm strongly considering it. What do you think? Would it be worth the effort? Have you painted kitchen cabinets and how are they holding up? Bottom line, don't pass up a home with good bones just because you don't like the finishing touches. Paint can easily be changed. Floors can be upgraded. Bathrooms and kitchens can be upgraded or remodeled. You, too, can have your very own Fixer Upper. Do you live in a Fixer Upper or have you? What has been the most dramatic change you've made? I'd love to hear about it! 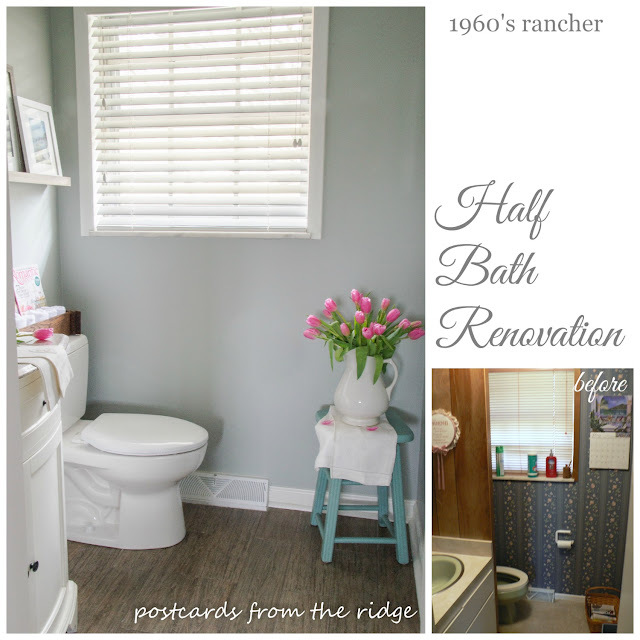 http://thecreativemeandmymcg.blogspot.ca/2015/02/almost-theremaster-bath-reveal.html - Thanks for sharing your inspiration! So many beautiful makeovers, Angie! I need you to come help me out ~ I'm in a decorating funk right now. I can't wait to see your finished bathroom. Your rooms are lovely!! 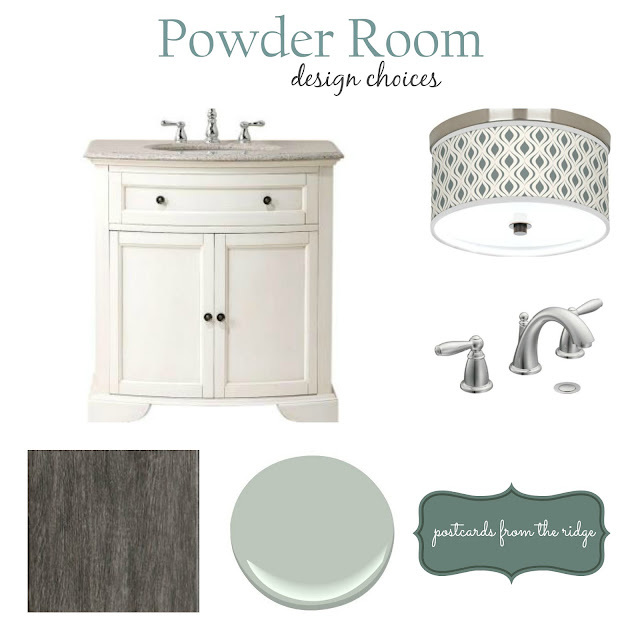 It will be fun to see your powder room when you finish! In your beautiful living room, you have a rug that is exactly what I am looking for....Can you tell me where you found it? where is your rug from in your living room?? I got ours about 5 years ago at a local shop. There's a similar one at Wayfair here http://shrsl.com/?~bbh9 or at Home Decorators here http://www.anrdoezrs.net/links/7306354/type/dlg/http://www.homedecorators.com/p/the-portico-rug/20/340/.